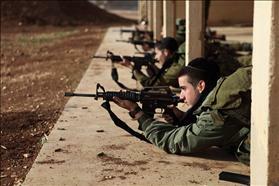 Haredi Netzah Yehuda Battalion soldiers at a firing range. 24.2.2012. Photograph: Nahumi Ya'akov, Flash 90. This past week, the Plesner Committee on Equal Burden Sharing met, a committee charged with finding a replacement to the now-infamous Tal Law. As the Tal Law expires this July, and the Supreme Court has ruled its exemption of ultra-Orthodox yeshiva students from the army unlawful, the Plesner Committee must find some solution to maintain a true People’s Army by drafting most ultra-Orthodox young men. Hiddush Vice President, Shahar Ilan, presented Hiddush’s proposal for the Tal Law: mandatory enlistment for all, along with an exemption of 3% of the class for excellent yeshiva students. “The cap of 3% was the practice in the 1970s and it’s reasonable to return to it”. The remainder of yeshiva students who receive “deferments” for service is 13%. But even the most mild proposal of MK Herzog, who only wants to cap yeshiva students at a 4,000, has no partner of the ultra-Orthodox leadership. According to Ilan, “The Tal Law failed. We tried incentivizing service and it didn’t work either. The only way is economic sanctions. The state must create a reality where the future of the yeshiva enterprise will be dependant onthe army service of most students.” This, Ilan says, will only work if they link the future funding of the yeshivas to support their other students' enlistement. Hiddush’s poll by the Smith Institute found 82% of Jewish Israelis want to require military service for all Israeli Jews. Hiddush’s proposal includes that any yeshiva student who refused service would, like their non-ultra-Orthodox counterparts, would not receive further yeshiva subsidies, benefits of national healthcare, tax benefits given to yeshiva students, housing benefits, or be able to work in civil service. “Draft dodgers will not receive a penny”. Ilan noted that the Plesner Committee is the fifth committee in which he has testified with regards to the Tal Law. He expressed his hope that this will be the last. “The Plesner Committee has a historic window of opportunity. If we miss it, the next committee might not be able to help.” Ilan presented the Smith Institute’s study on behalf of Hiddush: 82% of Jewish Israelis believe we should require everyone to serve, 52% of which support compulsory service for all, 30% are willing to allow exemptions for outstanding yeshiva students.